Episode 2 of the Podcaster News Show was hosted by me (Jen Thorpe). In it, I bring more news about women in podcasting. 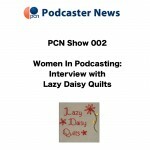 This episode featured Daisy, from Lazy Daisy Quilts, which is a podcast that is primarily about quilting.